NANJING– Duke University on Wednesday launched a joint university in Kunshan, east China’s Jiangsu Province. Duke Kunshan University (DKU), jointly established by U.S.-based Duke University, Wuhan University and the Kunshan government, will begin enrolling both domestic and international students next year, said DKU President Liu Jingnan. The DKU campus will cover a total area of 1,280 mu (85 hectares) and accommodate up to 7,000 students, he said. “The first batch of education facilities, which drew an investment of 950 million yuan and covers an area of 220 mu, have almost been completed. The teaching buildings, dormitories and conference halls will be handed over to the university next June,” said Liu. (950 million yuan is equal to 151 million U.S. dollars.) DKU will introduce Duke University’s “Elite Education” model to boost its educational level, said Richard Brodhead, president of Duke University. Brodhead added that DKU will be a comprehensive university offering undergraduate, postgraduate and doctoral degrees. Students will receive diplomas issued by Duke University. The deal for the joint project was inked by the three parties on Jan. 24, 2010. China’s Ministry of Education gave the project the greenlight in August this year. Duke’s connections with China go back to 1881, when Charlie Soong came from China as the first international student to attend Trinity College (now Duke University. Soon eventually returned to China to become a leader in business and education. Former Duke University President Terry Sanford led one of the first private delegations to China in the 1970’s, following the reopening of diplomatic relations. And in recent years, Duke students and faculty have created numerous educational, research and service programs in China. Today, Duke University has more students from China than from any other country outside the United States. Durham, NC – DUMAC, Inc. achieved a 1.0 percent return on Duke University’s endowment and other investments for the fiscal year ending June 30, 2012, bringing the endowment total to $5.6 billion, according to the university’s latest annual financial report, which was made public Tuesday. The return compared favorably to the -1.1 return for a portfolio used by the university as a benchmark for its own long-term investment pool. As a result of favorable investment returns and new gifts, the university’s endowment has largely recovered from losses it experienced during the financial downturn, including a drop of more than 25 percent in FY2009. In FY2011, DUMAC achieved a 24.5 percent return on investments. This past year, the market value of the university’s endowment declined slightly even though the investment returns were positive. This occurred because of planned distributions in support of university operations. Each year, Duke allocates approximately 5.5 percent of the average value of its endowment over the three previous calendar year-end totals to support designated ongoing operations. Duke University started in 1838 as Brown’s Schoolhouse. It later became the Union Institute Academy in 1841. The academy was renamed Normal College in 1851 and then Trinity College in 1859. In 1892 Trinity College relocated the campus from Randolph County NC to the city of Durham due to Washington Duke and Julian S. Carr.In 1924 Washington Duke’s son, James B. Duke, established The Duke Endowment and Trinity College would be renamed Duke University to honor the family’s generosity. Julian Abele, an African American architect, was the primary designer for the campus of Duke University. Julian Abele was the first black student to enroll in the Department of Architecture at the University of Pennsylvania, and became the department’s first black graduate in 1902. The original architectural drawings for the proposed campuses of Duke University are true works of art, grand in scale and exquisite in detail. As was common they are unsigned with the only credit being in the name of the Philadelphia firm of Horace Trumbauer, Architect. The chief designer of the firm and draftsman, architect Julian F. Abele, in discussing the unique style of the drawings, once proudly proclaimed, “The shadows are all mine.” With that statement Abele unknowingly articulated a central fact of his life. As an African American, he lived in the shadows as time and circumstance conspired to conceal his considerable professional talent. Julian Abele died at home in Philadelphia on April 23, 1950. It was Susan Cook, while a student at Duke University during the 1986 student protests against apartheid in South Africa, who wrote the letter to the student newspaper which made public Julian Abele’s role in the creation of the Duke campus. His portrait now hangs in one of the buildings he designed, and the Duke University Web site proudly acknowledges his work. Doris Duke was born on November 22, 1912 and was the only child of James Buchanan (J.B.) Duke, a founder of the American Tobacco Company and Duke Energy Company and a benefactor of Duke University, and Nanaline Holt Duke. Inheriting a bulk of her father’s estate in 1925, which included Duke Farms in New Jersey, Rough Point in Newport, R.I., and a mansion in New York City, Doris was soon dubbed by the press as “the richest girl in the world.” Although Doris did her best to live a private life, she contributed to a number of public causes and was an active supporter of the arts, historic preservation, and the environment. Doris Duke died in October 1993 at the age of 80. In her will she left the majority of her estate (estimated $1.3 billion) to the Doris Duke Charitable Foundation. House of Brodie L. Duke. 1883 Durham, North Carolina. Brodle L. Duke, was the son of Washington Duke founder of the Duke tobacco in rests, and brother of James Buchanan Duke and Benjamin N. Duke of New York City. Benjamin N. Duke home in Durham, North Carolina seen in 1910. ‘Four Acres’ was a large, Chateauesque Revival mansion constructed of granite and brick. After Benjamin N. Duke and his wife died in the late 1920s-1930s, the house passed to Duke University, who used the house as a guesthouse and reception area for 30 years. In 1960, Duke University decided to sell the property and building, and it was demolished soon thereafter for the construction of the African American owned North Carolina Mutual Life Insurance headquarters highrise office building. Built in 1915 James Buchanan “Buck” Duke purchases the home and triples it in size. Doris’s father, James Buchanan Duke, known as Buck, starting in 1893 he tried to reshape Duke Farms in the image of his native North Carolina, digging nine lakes and using the fill to make hills out of flat land. Three times the size of Central Park, the estate has 22 miles of trails winding past fountains, lagoons and sculptures; 810 acres of woodlands; and 464 acres of a grassland bird habitat. 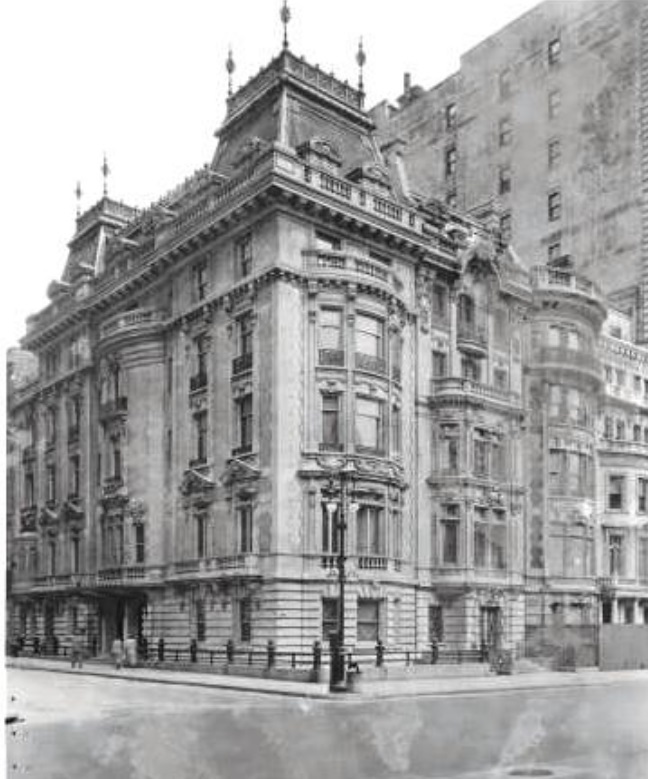 Benjamin N. Duke and his wife Sarah Duke, purchased the former Henry H. Cook mansion at 5th Avenue and 78th Street. His brother James B. Duke set about demolishing the Cook house and having a new mansion built on the site. Benjamin Duke and his family left No. 1009 Fifth Avenue and moved to the Plaza Hotel in 1909. James and his wife Nanaline and her son moved into No. 1009 5th Avenue. The new house at No. 1 East 78th Street was completed in 1912. By 1922 the house was again occupied by Dukes,this time Benjamin’s daughter Mary Duke Biddle and her husband Anthony J. Drexel Biddle, Jr. Mary Duke Biddle Trent Semans and her husband purchased the house from her mother’s estate. Benjamin Duke’s 20,000 square-foot mansion sold in July 2010 for $44 million. James B. Duke house at 4 East 78th Street, Manhattan, New York, NY was the childhood home of Doris Duke. She gave the house to NYU in 1958. Vanderbilt sold the property to William B. Leeds in 1906, and Leeds’ widow sold it to James B. Duke (benefactor of Duke University) in 1922. Frederick W. Vanderbilt, the 6th son of William H. Vanderbilt. Frederick’s older brothers, Cornelius Vanderbilt and William K. Vanderbilt had “summer cottages” of their own just up the street. Just one year after completing renovations in 1924, James B. Duke passed away. He left the home and his fortune to his 12 year old daughter Doris Duke. Doris continued to use the home up until her death in 1993 at the age of 80. Doris Duke’s Shangri La is near Diamond Head just outside Honolulu, Hawaii. Duke Energy, headquartered in Charlotte, North Carolina, is the largest electric power holding company in the United States. Duke Energy’s history began with the Catawba Power Company in the early 1900s. Three visionaries, Dr. W. Gill Wylie, James Buchanan Duke and William States Lee, founded the company to spur economic revival of the Carolina countryside. James Buchanan Duke invested in the Southern Power Company, founded in 1905. James Buchanan Duke was a tobacco and electric power industrialist best known for the introduction of modern cigarette manufacture and marketing, and his involvement with Duke University. His father was Washington Duke who owned a tobacco company in Durham, North Carolina. His sons James Buchanan Duke and Benjamin Newton Duke took over the company in the 1880s. American Tobacco Company held a monopoly in the American cigarette market. In 1911, the U.S. Supreme Court upheld an order breaking up the American Tobacco Company’s monopoly. Duke Energy CEO Jim Rogers gave the first of two keynote addresses at the Duke University Energy Conference on Wednesday, Nov. 28, 2012.